Pittsburgh Penguins general manager Ray Shero could probably use a good long nap. We’re still a couple of days away from free agency, but already Shero has been perhaps the most active GM in the NHL. Last Friday, he set his hometown crowd abuzz with draft day’s splashiest deal, trading Jordan Staal (who was, incidentally, the first draft pick he ever made) to the Carolina Hurricanes. Later that night, he also dealt defenseman Zbynek Michalek to the Phoenix Coyotes. As with all marriages, though, “till death do us part” can be a complicated thing. Let’s examine the Good, the Bad, and the Crosby of Sid’s sparkling new diamond of a deal, shall we? When Shero opted to part ways with Staal, who was to become an unrestricted free agent at the conclusion of this coming season, it was nothing if not remarkably swift: It had been reported only a day earlier that Staal had turned down an estimated 10-year, $60 million contract offer from Pittsburgh. Rather than allow the situation to continue to publicly wilt, Shero nipped it in the bud. The move yielded an impressive return, cleared substantial cap space, and preempted a year of “will he or won’t he” intrigue. With free agency going into effect this Sunday, the timing of the agreement is also a crucial signal to those players who are on the market. Sign in Pittsburgh, it says to them, and you’ll have Sid on your team for the long haul. It’s no secret that the Penguins, with their newly cleared cap space, will be making a run at premier free agents like Zach Parise or Ryan Suter. Crosby’s contract just became a big part of their pitch. This isn’t like football; contracts in the NHL are guaranteed, meaning that the Penguins would be on the hook if Crosby suffered further injury and was unable to play. Twelve years is a long time to commit to someone with such heightened risk, which means the question becomes whether the potential upside is worth it — and the feeling in Pittsburgh, apparently, is that it is. And I doubt the Penguins are the only ones to think so. Even if the team could earn a payout in the event of injury, that’s an actual-dollars, and not a salary cap, concern; the only way the team would be able to reduce Crosby’s impact on their cap would be under the auspices of long-term injured reserve, whose parameters are well-outlined here. 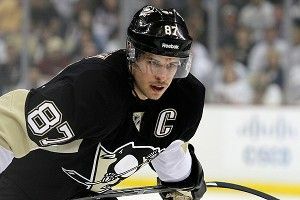 Sidney Crosby is a superstitious creature, all the way down to his jockstrap. He was born on 8/7/87, wears no. 87, and negotiated a contract in 2008 that averaged out to an $8.7 million cap hit — a number that he hit once again with this new extension. Hasn’t he ever heard of inflation? Under the CBA, a player can earn up to 20 percent of the team’s total cap, which means that Crosby theoretically could have pushed for a number closer to $14 million. That he didn’t — and that he didn’t even ask for a smaller bump from the status quo — suggests both that he wanted to give Pittsburgh enough flexibility to surround him with other star players, and that the Penguins wanted to, as absurd as it sounds given the term, minimize some of their risk. Even if Crosby’s career remains as pockmarked with injuries as his last two years have been, he’s such a Pittsburgh powerhouse at this point that the team would still benefit off the ice by having him as part of the organization. On the open market, Crosby easily could have commanded more money, which has led some to ask whether he is in effect handicapping the fortunes of other players in the NHL. Wayne Gretzky’s salary in the ’80s served as a de facto salary cap; when he was traded to/bought by the L.A. Kings, his new big bucks helped usher in an era of pay escalation. If Crosby’s cap hit is $8.7 million, the similar logic goes, how could anyone ask for more? (The answer: If they’re Alex Ovechkin, whose cap hit of $9.5 million is tops in the league.) But as Tyler Dellow writes, this isn’t the ’80s, and in a capped league, salaries can’t exactly continue to escalate in perpetuity. Much of the money that Crosby is forgoing will wind up in the pockets of another player. So, which player? For now, the Penguins will pursue all the biggest free agents. But the next step for the franchise will be figuring out what to do with twin tower Evgeni Malkin, this season’s most valuable player. Malkin is set to become a free agent in 2014. “The thing with Geno, as reigning MVP of the league, it’s almost like having two kids you’re equally fond of,” Shero said. Currently, Malkin’s cap hit is identical to Crosby’s at $8.7 million, a contract he negotiated a year after Sid. Whether he would also forgo bigger dollars elsewhere to remain in the Steel City remains to be seen, but the Penguins now have a year or two to figure that out. “We want to keep Geno happy and keep him a Penguin for a long time,” Shero said. Sounds familiar.